Walker: You just killed the Secretary of Defense. Stenz: Well, he wasn’t doing a very good job. Three months ago I’ve watched “Olympus has fallen” on a lazy Saturday night and I thought it wasn’t so bad. In my opinion “Olympus has fallen” is a straightforward, empty headed action film without a complicated storyline. The pure essence of this film is to produce as many dead bodies as possible. I was convinced we’d be witnessing that American superior patriotic feeling again and it would be one against all again and a cheering crowds as a closure. All in all, an excellent movie suitable for a saturday evening. 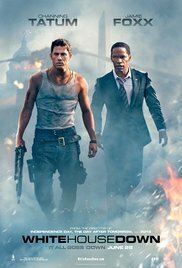 “White house down” actually looks identical. You might even dare to say that it’s a sort of a copy of the first film. And yet this one produced by Roland Emmerich is a tad better and more credible. Admittedly, there are some implausible things in it and a few plot holes as big as the hole in the ozone layer. But actually you’ll ignore that and you’ll enjoy the sequence of action scenes, massive shoot-outs and close-combat moments. The fact that a plain guy can come in easily and afterwards starts looking for an uniform in a storage with a flashlight in his mouth or a bunch of technicians start installing a dolby surround system and then run around with boxes, was a bit ridiculous. The most laughable thing was when Cale stood on the roof while being attacked by a Black Hawk and someone smart notices that he might be one of their side. Once again it’s about a security guard who’s not being accepted in the secret service, who becomes the hero and in the end saves the president. The fact that his daughter is also present and eventually is being used as bait to lure him out of his hiding, makes this movie to become a kind of “Die Hard” clone. But I thought Channing Tatum was convincing as a lead and Jamie Foxx is a pleasant interpreter of the American president and an inevitably imitation of Barrack Obama. The bad guys are again stereotypes. A bunch of brainless musclemen who start their mission well prepared and when everything goes wrong they all start to run around like headless chickens while trying to solve the problem. As a result they are killed one by one despite their superiority in numbers. In the end it turned out to be a cleverly planned scheme to become president. Well, I suppose it’s about that. For me, this was better than “Olympus has fallen”. James Woods was excellent as the retiring Walker. And Jamie Foxx excelled as president. He was even funny at times.